Makita DLX6072PT 18v 6 Piece LXT Multi Tool Kit Lithium Ion Li-Ion Accessories Stock Code: DLX6072PT This set replaces the DLX6044PT The Makita 6-piece lithium-ion LXT Combo kit includes a compact high-torque combi drill,impact driver with all-metal gearing, 165mm circular saw, angle grinder with thermal overload and accidental start protection, reciprocating saw with tool-free blade change and torch, with 3 x 5.0Ah Li-Ion batteries and a Twin Port 22 minute Multi-Volt Rapid Battery Charger in a Heavy Duty Canvas Tool Bag. Models in Kit: DHP458Z - 18v LXT Combi Drill DSS610 - 18v 165mm Circular Saw DTD152 - 18v LXT Impact Driver DJR186 - 18v LXT Reciprocating Saw DGA452 - 18v LXT Angle Grinder BML185 - Torch Features of the Makita DHP458: Compact design . DHP453Z: LXT Combi Drill. Selection of Six Makita Tools. DSS611Z: LXT Circular Saw 165mm. DTD152Z: LXT 18v Impact Driver. DJV180Z: 18v Jigsaw. Vibration K factor: 1.5 m/sec². Noise K factor: 3 dB(A). Noise K factor:3 dB(A). IMPACT DRIVER : Variable speed Impact Driver (0-2,900 RPM & 0-3,500 IPM) provides 1,460 in.lbs. of Max Torque. of Max Torque; weighs only 3.9 lbs. with battery. Variable speed Impact Driver (0-2,900 RPM & 0-3,500 IPM) provides 1,460 in.lbs. 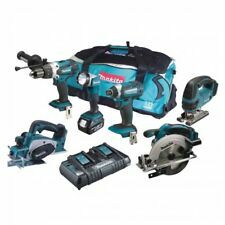 Grab yourself a fantastic deal Makita cordless tool set: 18V LXT Impact driver, LXT 18V Combi Drill, 18V LXT SDS Drill, 18V LXT jigsaw, 18V LXT circular saw, 18V LXT angle grinder, 18V LXT multi-tool. 18V LXT work lamp, 18V 4.0Ah LXT battery X 3 and 1 fast charger. Type 2 Mak Pak storing case X 3, type 3 Mak Pak store case X 1 All in excellent working condition, as pictured. Free collection and free postage. Cost £1300 new, save yourself £450! Contact me with any questions, reason for selling is that I'm moving to Australia. Thanks for looking. 1x DHP458 Combi Drill. 1x DHP458 Side Handle. 1x DHP458 Depth Stop. 1x DHP458 Belt Clip. 1x DTD152 Impact Driver. 1x DTD152 Belt Clip. DHP458 Combi Drill. DTD152 Impact Driver. 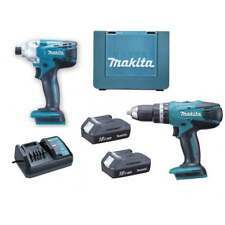 makita drill impact set. Used but in excellent working condition. Come with: carry case charger 2 x battery impact gun drill please feel free to contact me for any further information Dispatched with Royal Mail 1st Class. The DLX2131 Twin Kit from Makita will replace the DLX2012 Twin Kit and contains models DHP482 and DTD152 with 2 x 3.0Ah Lithium-Ion Batteries. Supplied in a Makpac type 3 connector case. 1x DHP482 Combi Drill. 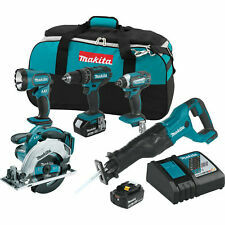 Makita 18V Power Tool Kit - DLX2131J charger 2x 3.0 ah battery and cace postage only uk. 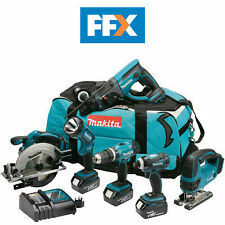 Makita XT275PT 18-Volt 5.0Ah 2-Tool Cordless Drill&Impact Combo Kit NISB F/SHIP!